Well domesticated as pets, canaries are some of the most fascinating little birds! They are active, cheerful, beautiful, and have a delightfully lovely song! With such a busy world today, pet canaries can make an ideal companion for many people. Canary pet birds are colorful and have pleasing personalities. There is nothing like a peaceful, pretty canary song to unravel nerves at the end of the day. Most types of canaries can sing, though they may not sing all the time. A canary singing is entertaining in itself but they have some other very desirable traits as well. Adding a pet canary to your home doesn't add an unwelcome burden. They are small, so keeping canaries takes up very little space. They are also less costly to purchase than many of the larger parrots and some of the other soft billed birds. Canaries are hardy and undemanding, so the canary bird care is pretty easy. They don't pout like a parrot might if you are unable to play with them. And of course, being 'bird-oriented' rather than 'people-oriented', they are unlikely to become finger tame birds. You can simply sit back, relax, and enjoy the antics of these little charmers, and a pretty canary song as well. All domestic canaries originated from the Island Canary Serinus canaria. There are basically three types of domestic canary today; the Color Canary bred for various canary colors, the Song Canary bred for their canary song, and the Type Canary bred for distinct characteristics of shape, feathering, and size. Though there are many varieties of canary from which you can choose, some breeds that were popular at one time are no longer be available, having made way for new varieties and the varieties that are currently popular. Domestic pet canaries are distributed throughout the world. There are some very fascinating canary bird facts about the development of these birds and the different canary breeds of both yesterday and today. The ancestor of the domesticated canary we see today can be found in the Canary Islands, Azores and Madeira. Since 1478, when they were first imported into Europe, the domestic canary breeds have changed. Actually there have been many changes in the canary breeds over the years, with changes occurring based on the commercial popularity of some breeds over others. Canaries were introduced to Spain in 1478 when the Spaniards conquered the Canary Islands. For over 100 years, until the 16th century, the Spaniards maintained control of these delightful little birds, selling only males to other European countries. Then, due to a shipping accident, a large cargo of canaries escaped and flew to the Island of Elba. They soon were sold all over Europe and many different canary breeds began to be developed. Some countries specialized in breeding canaries for their song, while others bred them for color, body type, or feathering. Thus some canary breeds are named and classified by their shape and the geographic areas in which they were developed while others are named and classified for their plumage, song, or color. Different countries became known for the classification they bred, for example, the Germans bred for the canary song while the English and French bred for canary colors. The canary is generally between 4 3/4" to 8" (12-20 cm) in length. Their plumage is very bright starting in the yellows, yellow-greens, greens, shades of orange to shades of red. The canary life span varies somewhat from bird to bird. The average life span of a bred female canary is 5 - 6 years and for a male canary, up to 10 years, though there have been canaries that have lived up to 20 years. This group includes birds specifically bred for various canary colors. Also known as Color Bred Canaries, they have been developed in just about every conceivable canary color. This group also includes the Red Factor Canary. 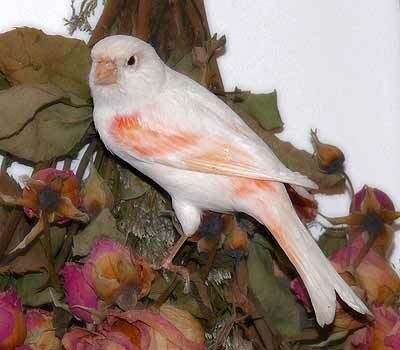 Red Factor canaries can be found in all shades from very light oranges, coppers, deep red-oranges, to almost red. The Red Factor is a strain that many experts agree was achieved from interbreeding the canary with the Red-Hooded Siskin, Carduelis cucullata. Today, in the wild, the Red-Hooded Siskin is very rare and is endangered. This group includes birds specifically bred for their canary song, well known is the Roller canary. The bird food in a canary diet consisting of a good seed mixture (vitamin coated) supplemented with sprouted seed, various fruits, green foods, and commercial pellets are generally regarded suitable. Fresh food and water must be provided daily. Fresh canary seed is their everyday food and vitamin coated seed mixes are readily available at a pet store. A single canary will eat about one teaspoon of seed a day and canaries will rarely overeat, though they may need to eat a bit more when the weather is cold or during their moult. Pelleted diets are also available and contain vitamins and more protein than seed, making additional supplementation unnecessary. However birds not raised on a pelleted diet may not recognize it as food, so may not accept it.. Supplements are very important and can be put in an extra dish and rotated for variety. Daily supplements that canaries like to eat include greens such as kale, broccoli, dandelions, spinach, celery, peas, and watercress. Small amounts of fruits such as apples, oranges, grapes, bananas, and melons can also be offered. Canary treats of seed with honey, fruits and vegetables are fun for your bird too, as well as nutritious. However there are some that feel these treats will contribute to a lethargic or lazy bird that may be less inclined to sing. Every few days you can also provide some song food to help develop vocal cords. Most canary seed mixes have vitamin coated seeds. However, if their canary seed is not vitamin enriched, vitamins can be added to the drinking water or the food. Provide a cuttlebone or a mineral block. The calcium they provide will give your bird a firm beak, strong eggshells when breeding, and will prevent egg binding. The lime in the cuttlebone also aids in digestion. Today in the United State the use of grit is being discourage as being unnecessary for canaries because they shell their seed. However in the past, and still in most other countries today, it is considered an important ingredient for the canary diet. It is said to be essential in providing necessary minerals and elements as well as an aid in digestion. Possibly this change is a result of commercially developed pelleted diets. A canary cannot live without for a 24 hour period without water! Provide fresh water daily. Give your canary a bath at least once a week and daily during the summer by placing a dish on the bottom of the cage. A bath with an enclosure will help to keep the water splashing to a minimum. Bathing is very important to canaries during molting and breeding. Canaries like wide open spaces so provide your pet with a roomy canary cage. Also provide dishes for food, water, and treats as well as an area for a bath. Provide two or three good softwood perches about 3/8" to 3/4" in diameter. Tree branches of a similar size also make good perches and will help to wear the claws down naturally. Place the cage on a stand or hang it from a wall bracket at eye level or at about 6 feet off the floor. Be sure the spot you pick has good light and is well ventilated, though free from drafts. It should be away from doors and windows where direct exposure to sunlight can make it overly warm, but placed close to at least one wall to enhance a feeling of security. Average daytime temperatures can range from between 60 degrees to 70 degrees Fahrenheit with nighttime temperatures down to 40 degrees Fahrenheit. The cage should be covered at night to prevent drafts and disturbances. A roomy indoor aviary, a bird room, or an outdoor aviary (depending on your area) are all good choices. The aviary needs plenty of light and fresh air. The outdoor aviary needs to have a protected shelter that can be heated and cooled where necessary and a canary flight cage made with about a 3/8" wire mesh, anything larger will let in mice. Although canaries require very little time, a clean environment as well as fresh food and water daily is a must to prevent disease and illness. The basic cage care includes daily cleaning of the water and food dishes. Every two to three days change the paper on the bottom of the cage. Weekly wash and dry the entire cage, including the perches. Canaries are very social with good personalities. They will not harm children, visitors, or other pets. They are, however, timid birds and should not be housed with parakeets, lovebirds, or other hookbills that tend to be more aggressive birds by nature. Pairing up with two male canaries in a cage can cause fights, but canaries can easily be housed in a spacious cage with other canaries, finches, and other hardbills. Most of the time, canaries are simply enjoyed for their beauty and singing. However, some canaries are allowed out of their cage to perch or are show canaries and therefore require taming or training. Canaries can some simple tricks such as playing with a toy, but they are quite timid and it takes a lot of patience. If they are exposed to sounds when they are young, male canaries can also learn to mimic sounds such as a telephone ring or a door bell. If you wish to tame or train your canary, it is best to buy a single bird, and it is easier to tame a young bird. Wing clipping will make it much easier as it inhibits their ability to fly. When you need to hold your canary, place your palm on it's back and wrap your fingers around the bird with your thumb and forefinger on either side of it's head. Canaries rarely bite, and even if they do, they do not have a harmful or dangerous bite. Taming or training a canary requires a lot of patience and persistent effort. Canaries prefer to be able to move around and it is important to their health and well being that they be able to fly from perch to perch. Keep the cage accessories to a minimum to allow free movement. A single toy, mirror, or branch will be plenty and you can change them around periodically to provide variety. In the wild, canaries love to roll in dew dampened grasses for a bath. You can give your pet a treat by occasionally putting in damp dandelion leaves or grasses in the bottom of the cage for a few hours. An enclosed bird bath put in the cage a couple of times a week will also provide a fun bath for your pet. Just do not let your pet get cold! Canaries are fairly easy to breed in captivity if you provide them with privacy and very few disturbances. The canary breeding season begins with the arrival of spring. The female should be at least one year old and the male should not be over five years old. Both the male canary and the hen must be very well fed and healthy. Introduce the male and female to each other in separate cages side by side for a few weeks before putting them together so they can become familiar with each other and prevent fights. You should supplement their diet with bits of niger seed, spinach, lettuce and dandelion leaves. Also put a bit of olive oil or wheat germ oil on their egg biscuit to prevent constipation and egg binding in the female. A box breeding cage is good and should be about 18"x 11"x 14" (46 x 28 x 36 cm). Mount a nesting pan of ceramic, metal, or earthenware, or a wicker nest inside the cage. For the canary bird nesting material, place a layer of soft wood shavings, corn cob bedding, or other canary nesting material in the nest. The female will lay an egg a day until there are two to six eggs. Remove each egg gently with a spoon and replace it with a dummy egg until she is done laying. The removed eggs can be placed on cotton, sand, cornmeal, oatmeal or wood shavings and turned once a day until you return them to the nest when the female is done laying. Some breeders believe it is best to remove the male at this time so he will not interfere with the female and keep her from brooding. Others feel that the male may tend the female while she is brooding. If you choose to leave the male, make sure the female is staying on the nest brooding the eggs. After 12 days, offer the female a bath. She will bathe and return to the nest, dampening the bedding and moisturizing the eggs. This softens the membranes of the eggs for the young that are about to hatch. The eggs will hatch on the 13th or 14th day. At this time provide the female with nesting food and soft foods of bread soaked in milk, hard boiled egg yolks and a bit of apple. At about two weeks, return the male to the nest to help feed the young. The hatchlings are born blind and featherless. At about two and a half to three weeks, they will begin to feather and leave the nest to perch on low perches. They will be independent and eating seed at about six weeks and the female may be nesting again. Do not let a pair breed to much or they will start to produce weak babies! Canaries are very hardy birds and almost all illnesses can be traced to improper diet, dirty cages, and drafts. A balanced diet and plenty of exercise will prevent most canary illnesses. If a canary becomes ill it will lose weight rapidly, so it is essential that you know your bird and watch for real drastic changes as indications of illness. Some signs of illness to be aware of are droppings that are not black and white, feathers that are ruffled, lack of appetite, wheezing, molting out of season, does not sing, and acts feeble and run down. Some of the common illnesses and injuries your canary could contract are broken wings or legs, cuts and open wounds, overgrown beaks and nails, ingrown feathers (feather lumps), feather picking, false molt caused by mishandling or a poor diet, confinement cramps in the legs from a cage that is too small, weight loss, heat stroke, shock, concussion, egg binding, diarrhea, mites, colds, baldness, scaly legs, sore eyes, tumors, loss of song, constipation, and diarrhea. Canaries are widely available in the pet industry. A large selection of characteristics can be found in canaries for sale from, color, song, size, feathering and shape. Canaries for sale that are young birds, those that have completed their first molt, are easiest to get in the fall just before the end of the breeding season. These birds are best if you want one to tame your canary or to train your canary for show. Canaries are also a fairly inexpensive little birds.